Imam Muhammad Baqir(a.s) was born in the 57th year of the Hijra, on Friday the first day of the month of Rajab, in the city of Madina. His honoured father is Imam Sajjad(a.s.) and his revered mother, Fatema, daughter of Imam Hasan(a.s.). He was the only Imam who was Alawiite from both the side of the Mother and the Father. Imam Sajjad(a.s.), according to the command of Allah(swt) and the decree of the Prophet(pbuh&hf), appointed his son, Imam Muhammad al-Baqir(a.s.), to Imamate and leadership of the people in the 95 A.H. He remained Imam for the rest of his life until 114 A.H. and the total period of his Imamte is 19 years. Allama Hajr Makki writes in Sawaeq-e-Moharaqa (Page 120) that He was the true copy of his father Imam Sajjad(a.s.) in knowledge, piousness and prayers & supplications. 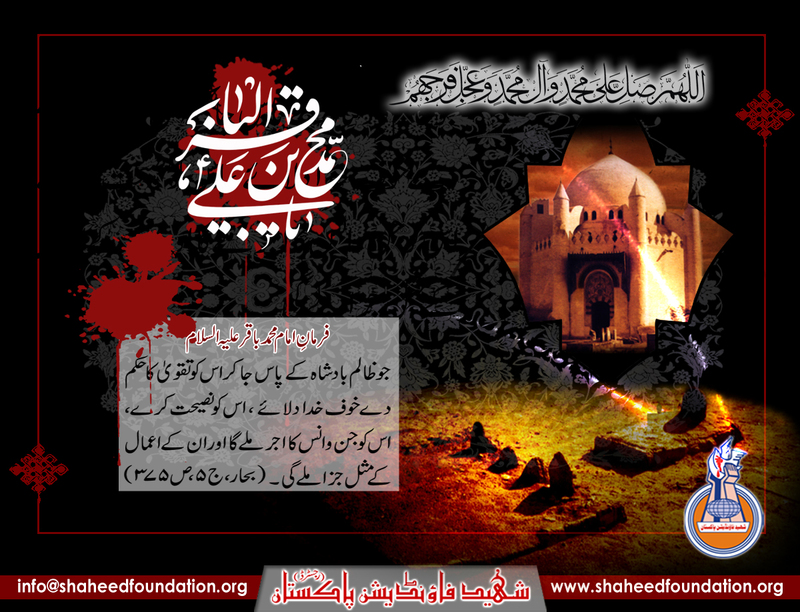 He became Imam after the martyrdom of his father and became the 5th Imam.Imam saw the whole incident of karabala in his early age.The whole Immamat was more alike a peaceful one, with no war.He led his whole life in teaching Islam.He is highly regarded by the sunni sect also.Even Abu Hanifa was the student of Imam. Imam Muhammed al-Baqir was awarded the title Baqir al-'Ulum "Revealer of Knowledge" because of his ample religious and judicial knowledge and his enthusiasm to teach others. Imam Muhammad al-Baqirâ€™s son, Imam Jafar-e-Sadiq, was his student and benefited from his knowledge. He founded the precursor of ShÄ«â€˜ah jurisprudence. Despite his aversion to politics, the Umayyad rulers harassed Muhammad al-Baqir for fear of his popularity and influence. This was the time when the early discussions and differences in the community surrounded the question of who has the right to rule.The actions of his brother and other kinsmen made them distrust him. Numerous Shia individuals and delegations from Kufa traveled to Medina under the cover of the Hajj ritual to attend al-Baqir's teaching and to ask him specific questions. In 100 A.H. Hashsham bin Abdul Malik became the Caliph. He was a known enemy of the Ahl-e-Bait(a.s.) and he did not waste any opportunity to bring hardship to the Ahl-e-Bait(a.s.). Allam Majlisi writes that during the last days of his caliphate, Hashsham came to Makkah for Hajj. Imam Mohammad Baqir(a.s.) and his son Imam Jafer Sadiq(a.s.) were also present. Hashsham was informed that Imam Jafer Sadiq(a.s.) delivered a sermon among the Hajis that he and his father were the Allah's vicegerent and His command on earth and whoever was their friend and well wisher will go to heaven and whoever is thier enemy will be destined to hell. This infuriated Hashsham and when he reached Damasacus, he ordered the governor of Madina, Ibrahim bin Walid to send the two Imams(a.s.) to his court. Hashsham had planned to malign the Imams in his court but the Imams(a.s.) overturned his plans which further ignited his enmity and he orderd the Imams(a.s.) to be jailed. While in the jail, Imam Mohammad Baqir(a.s.) gave sermons to the other prisoners which created an atmosphere of great enthusiaism and devotion towards the Imam(a.s.) and against Hashsham and sensin the gravity of the situations and the risk of a revolt, Hashsham ordered the release of the Imam(a.s.). He then ordered the governor of Madina that Imam Mohammad Baqir(a.s.) should be poisoned as he is becoming a constant threat (Jala-ul-Ayoon Page 262). The governor of Madina - Ibrahim bin Walid carried out the orders and poisoned the Imam(a.s.) in 114 A.H. Imam Muhammad Baqir(a.s.), lived in this world for a period of 57 years, and in the 114th year of the Hijra, on the seventh day of the month of Zil-Hijjah, in Medina he left this world. His body was buried in Baqi cemetry alongside the graves of Imam Hasan(a.s.) and Imam Sajjad(a.s) in Medina. c) They offer their prayers, observe fasts, and recite Qur'an.